Tucked away on the far south-western fringes of Australia’s Arnhem Land Plateau is Nitmiluk National Park, a 2928 square kilometre little brother to the World Heritage Listed Kakadu. Nitmiluk, named by a dreamtime ancestor, Nabilil, for the drumming sound of the cicada…Nit! Nit! Nitnit! This landscape belongs to the Jawoyn, freshwater people. 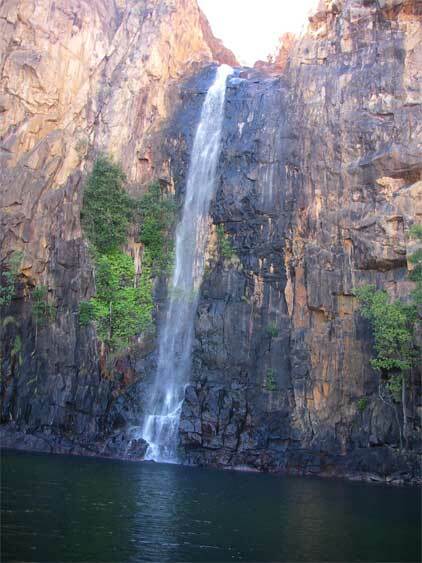 It is also home to a major Northern Territory tourist destination, Katherine Gorge. Less well known is Nitmiluk’s 58 kilometre Jatbula Trail, one of the most spectacular remote area track walks in Australia. This outstanding walk climbs up onto the Arnhem Land Plateau and features magnificent views across 17 Mile Creek Valley, Aboriginal rock art, waterfalls, gorges, rapids and secluded rockpools. The Jatbula honours Peter Jatbula, a former drover and aboriginal custodian, who fought to have Nitmiluk returned to its traditional owners in the 1970s and 1980s. It was finally handed over to its traditional owners on the 10th September 1989. For my money, the Jatbula showcases some the best that Arnhem Land has to offer and even the most blasé trekker will be captivated by its landscapes. And to walk over country that resonates with human occupation stretching back at least 20,000 years is especially pleasurable. The trail is officially ‘challenging’ but for most bushwalkers, once conditioned to the warmer days, it is really quite easy. In the parlance of our leader, Kiwi Ross, it is a ‘spiv’ walk. The first two days traverse the high “stone” country above the escarpment, each day dropping down to a campsite beside placid rockpools, running cascades and roaring waterfalls. 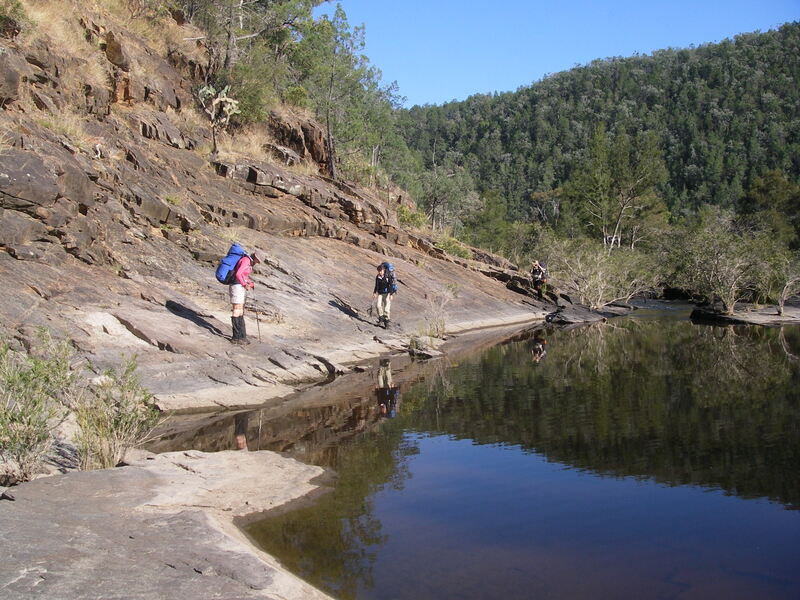 The final three days take walkers into the headwaters of the Edith River and then downstream to the campground at Leliyn (Edith Falls). 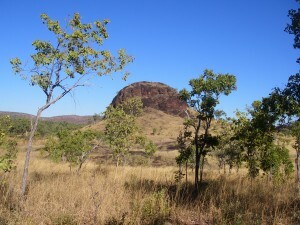 Wednesday 27 June: Nitmiluk Visitors Centre to Biddlecombe Cascades: 8 kms. So here we are. Ten throughwalkers sardined into a snub-nosed punt, nudging up to the northern bank of the Katherine River, Jatbula’s trail head. A stone’s throw away on the opposite bank the circus was in town. This was the Nitmiluk Visitors Centre and Campground. A tourist bedlam, bustling with all manner of backpackers, flashpackers, campers, glampers, trampers and tattooed Territorians rubbing shoulders with jaded German jetsetters: all 200,000 of them, most arriving in the five months of the Northern Territory’s cooler dry season. Our 5.30am campground starts are not universally welcomed. 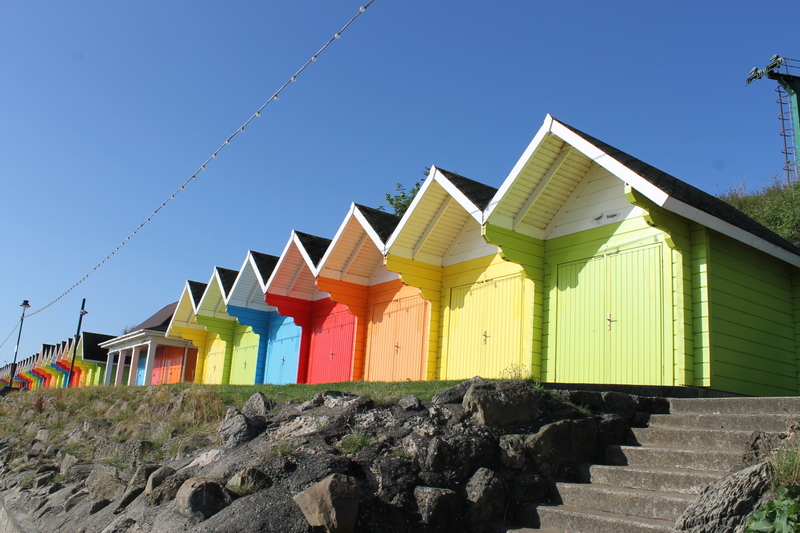 But things could only get better for long suffering fellow campers. And they did. For a start, we vacated the campground soon after 7.00 am allowing our neighbours to catch another ten winks before sunrise. Meanwhile, we had lined up for a surprisingly bargainous breakfast, a poolside buffet. Our chef arrived fashionably late, Top End time. Chef piled our plates with lashings of sizzling sausages, gooey eggs, crispy bacon, crusty toast and sachets of jam and vegemite all washed down with multiple mugs of tea and coffee. Brilliant. Back on the northern bank our party of eight disembarked: Kiwi Ross, leader; those sirens of the savanna: Linda, Di, Lyn and Sally; Don, an experienced track dog from way back and Brian, his silver-tail sidekick from Peregian Springs. And finally, this pudged-up scribe. Our companion walking party was a couple from Brisbane: George and Mildred. Or was that a TV show from my youth? Graham and Mildred? By walk’s end my brain had it sorted: Marion and Charles or mostly just Charlie. And the best of track companions. Our first section struck out across a baking savanna woodland heading for the cool oasis of the Northern Rockhole some four kilometres from the drop off. Already the day was firing up to be a stinker. An early departure is the key to enjoying this country and the trick is to trek in winter, start early, drink plenty of water and swim often. We learnt to leave our campsites by 7.30ish when temperatures are a mild 12-14°C and complete the day’s walk by early afternoon. By midday, temperatures are hovering around the 28-30°C mark. Remember that these temperatures are measured in the shade. It is said that above the escarpment, on the stone country, temperatures rise by a further 5-10°C, a fact which I wouldn’t dispute. Water is the second key element of walking in the Territory. 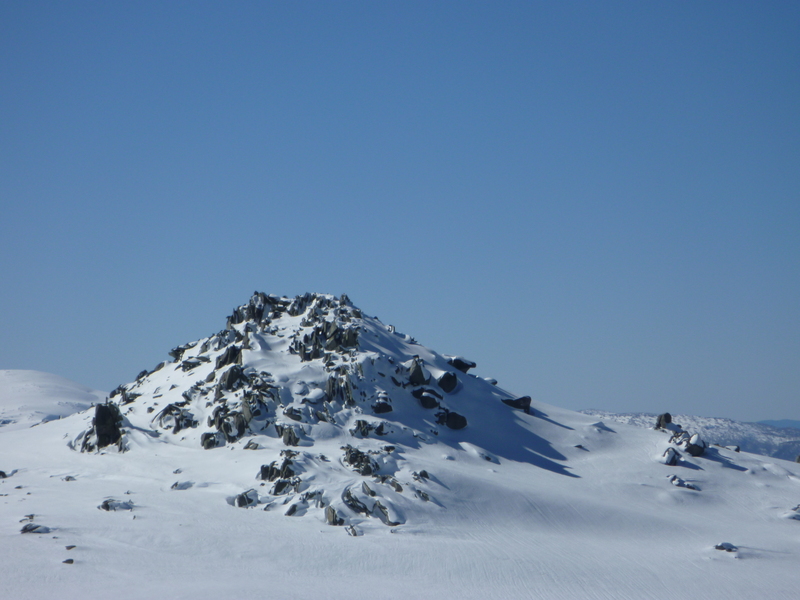 Initially I had hoped to do the daily ten to fifteen kilometres from camp to camp sneaking along on a litre of water. But after our experience in the open savanna on the first morning most of us elected to carry at least two litres from camp to camp. Another useful trick was to dunk hats, heads, shirts and bodies into any rockholes that crossed our path. Speaking of rockholes, the Northern Rockhole was our first morning tea stop-over. This is a large waterhole where a creek tumbles 50 metres over the escarpment to a deep green plunge-pool below. Distinctly crocodilian. I resisted the temptation to take a dip. Not that I’m aquaphobic but swims could keep until I was over the escarpment and on the plateau. Safely out of the clutches of any peripatetic croc out on a day walk from the nearby Katherine River. Rule Numero Uno of Top End swimming is that pools on top of the escarpment are safe, because crocs can’t, in theory, climb. Pools at the base of the escarpment should always be treated with some suspicion, especially as I had spotted a croc trap while paddling down the Katherine Gorge the previous day. From the Northern Rockhole the trail follows a 4WD service track as it climbs a long spur up to the plateau at 200 metres, walking us through a snapshot of 1650 million years of Arnhem Land geology. First, past outcrops of volcanics to finally reach the Kombolgie Sandstones which outcrop across vast swathes of the Arnhem Land Plateau. But more of that on the morrow. Savanna Woodland, Jatbula Trail, NT. We were now meandering through open woodland and spinifex grasslands, sometimes called savanna woodland. 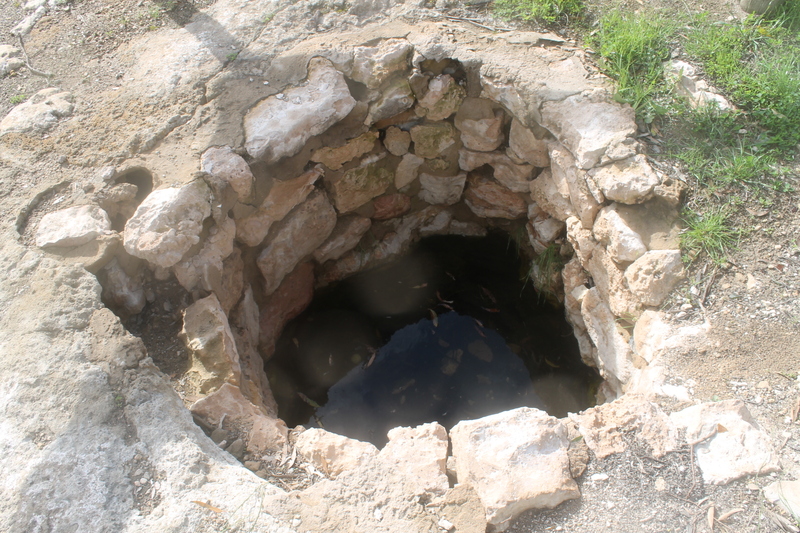 This is a harsh dry environment with surface water draining quickly into the sandstone. Scruffy vegetation has adapted to thin and poorly developed soils. Occasional high level bogs and swamps covered with reeds, banksias, grevilleas and even sundews provided a contrast, a pick of green in the drab landscape and fed the permanent streams like Biddlecombe Cascades, our first overnight stop. We heard the cascades before we saw the campsite, mostly shady with grassy tent sites. And here was our introduction to Mukkul, the green ant. Don pointed out two large arboreal leafy green ant nests woven together with their silky exudates. From here columns of ants marched down the tree trunk and fanned out across the campsite in search of food and human trespassers. Ian Morris in his book Kakadu has an entertaining description of their behaviour: “Green Ants are not particularly tolerant of humans and will respond to a disturbance…. by swarming over the intruder. Their multiple bites are mostly nuisance value…. but their habit of directing a fine jet of acid up to eight centimetres can cause extreme discomfort if it hits the eye.” According to Ross, the Mukkul is a Jawoyn delicacy, much like the honeypot ants of Central Australia or the chocolate-coated ants that my sister had an expensive addiction to. Never one to pass up a good feed, Brian, a well practiced trencherman, chose a large meaty ant but didn’t back up for his usual seconds. And he baulked at squishing their nests which is supposed to make a nice zesty drink when added to water. Biddlecombe Cascades, Jatbula Trail, NT. The cascades were named after an early gold miner, Biddlecombe. But prospecting was last thing on our minds; we were more interested in seeking out a prime spot for a cooling dip in the numerous and private rockpools and spas that abounded above the falls. And so the pattern of our days was set. Start early, walk in the cool, campsite in time for lunch and then a long afternoon of sloth and swims. By late afternoon the Biddlecombe Campsite was full. Our eight, Marion and Charlie and finally four young walkers who blew in late afternoon, having driven from Darwin in the morning and walked in the heat of the afternoon. Mad dogs and Territorians. Thursday 28 June: Biddlecombe to Crystal Falls: 10.5 kms. Out in the pre-dawn darkness. To the east a brilliant astronomical display for early risers. Shining closest to the eastern horizon was Aldebaran, brightest star in the constellation Taurus. Then two very bright planets, Venus and Jupiter. But the real gem of the morning sky was an open cluster of stars, The Pleiades or Seven Sisters. The star names are taken from classical mythology and are the seven daughters of Atlas who were pursued by Orion. Zeus, taking pity on them, placed them in the heavens as stars but even there Orion continued his chase. The brightest is called Alcyone who was daughter–in-law to Lucifer, the light-bearer, the star that brings in the day. In fact there are hundreds of giant blue stars in this cluster but only seven are visible to the naked eye. We were all up, fed and track side by 7.45am closely followed by Marion and Charlie. Here’s the thing about this pair. Both were elderly and Charles had a disability, a problem with his leg. The rocky track and river crossings would have been difficult for Charlie but they were obviously experienced walkers and really dogged. We would swan past, but no sooner had we pulled up for a break in the shade than Marion and Charlie would glide effortlessly past leaving us scrambling to play catch up. Kombolgie sandstones. We found plenty of examples of ripple marks and cross-bedding testifying to their origins in shallow fluvial or lacustrine environments. 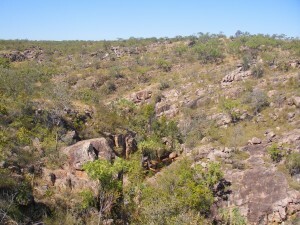 The main bedding planes in the Kombolgies are horizontal, reflected in the level surfaces over much of the Arnhem Land Plateau. Interleaved with the sedimentaries are two episodes of volcanic activity, the dark basalts which we saw yesterday as we traversed Seventeen Mile Creek Valley and on the climb up onto the escarpment. The Jatbula follows in part old droving trails but more significantly it follows the ancient song lines of the Jawoyn. These were landscapes created in a time known as Buwarr, The Dreaming, when the ancestors journeyed across Nitmiluk bringing to life its plants and animals, visiting rock shelters and leaving important artwork. This land was created by Bula, a saltwater being. Bula, accompanied by his two wives, the Ngallenjilenji, journeyed across Nitmiluk creating and naming the landscape as he went. Another dreamtime ancestor was Nagorrko, who told the Jawoyn what skin names they should have and taught them about proper behaviour and marriage relationships. Other creation ancestors included Garrkayn, the brown goshawk; Ngarratj, the white cockatoo; and Barrk, the black wallaroo. So it wasn’t surprising to find art sites at several of the rock outcrops that we passed on our morning’s travel. 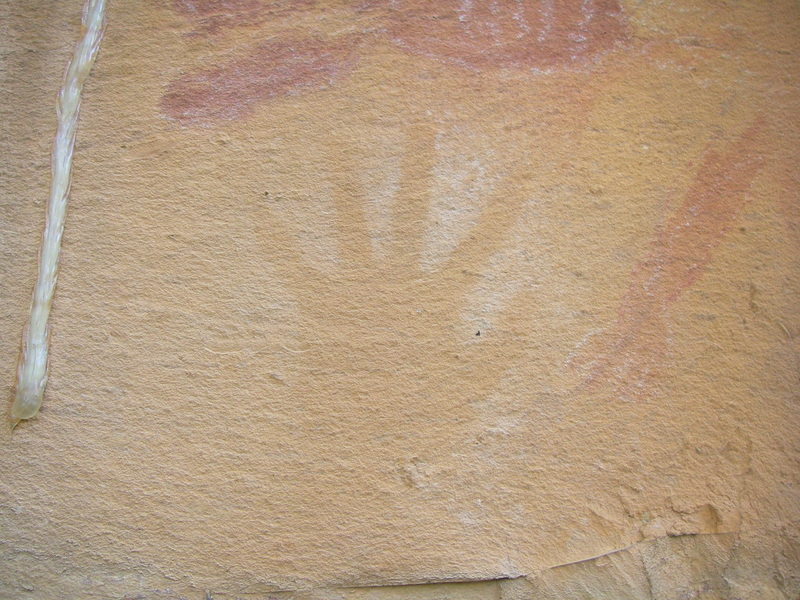 The rock art was predominately simple in design: for example, a red ochre hand print, representative of the earliest art work. Other motifs included human stick figures with large headdresses and skirts; larger human figures in red ochre; and highly ornamented figures in motion, the dynamic style. But there was a paucity of animal designs or animals in hunting scenes. These art styles are typical of Pre-Estuarine Art (50,000 – 8,000 years before present); a time when the earth’s climate was cooler and drier and a land bridge existed between Northern Australia and New Guinea. For the remainder of the morning the trail paralleled the escarpment edge. We cut across six major streamlines, all tributaries of Seventeen Mile Creek and all aligned at roughly 90 degrees to Seventeen Mile, indicative of the strong structural control over the drainage patterns in Nitmiluk. Eons ago, regional crustal tensions cracked and faulted the Kombolgie Sandstones and overlying Cretaceous sediments, often at right angles, forming orthogonal cross joints across the plateau surface. Streams later followed these surface weaknesses and faults leading to the spectacular gorges and rectangular drainage patterns we see today. Soon after midday we pulled into Crystal Falls, a pokey hot campsite saved only by its proximity to perfect swimming holes and spas. Di and I took to the largest pool immediately while the rest drifted hither and yon in a desultory fashion hoping to unearth a half-way decent tent pad. Trust me, there were none. I moved several times…too hot…too dusty…ant ridden…too close to crocs… before settling on a make-do campsite. The four youngsters drifted in, had a swim then headed off to 17 Mile Falls, ten kilometres hence. Spartans. Late in the afternoon three older walkers sweated it it having walked through from Katherine Gorge in the heat. Clearly shattered. As was our solitude. 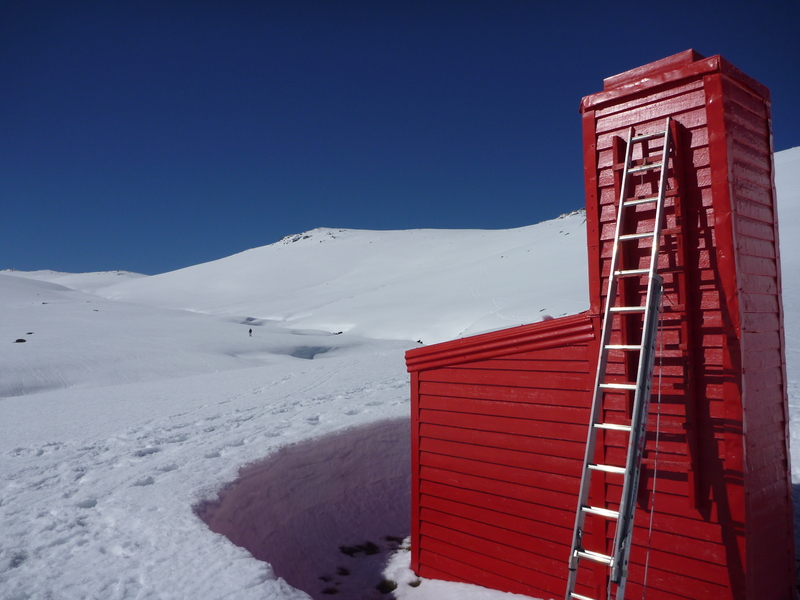 A helicopter chuttered in low over the campsite and settled on the emergency helipad set high on the ridge behind us. A genial Kiwi pilot appeared bearing a picnic hamper, all apologies for the intrusion. Two guest appeared. One, a matchy matchy matron from Tassie. Her fellow passenger: unkempt, decked out with dreadies. In fact, badly in need of a major zhooshing up. In any event they disappeared out to the cascades to enjoy their picnic. In due course our new best friend, the pilot, returned, clutching a barely touched bottle of bubbly and scrumptious left-overs from the hamper. Compliments of his guests. Stand aside Usain Bolt. It was a winner-take-all scramble back to the tents for mugs. By 4.30 pm our helicopter and its occupants had departed leaving behind a campground of slightly blootered hikers and a tube of perfumed aloe vera ungulate for Brian’s legs. Time for an afternoon explore, a look at the falls. Fortunately, as was often the case, Marion and Charlie had already scouted out the best vantage point: a superb view of the falls and in the other direction, a look down into water foaming through a deep, dark slot canyon. 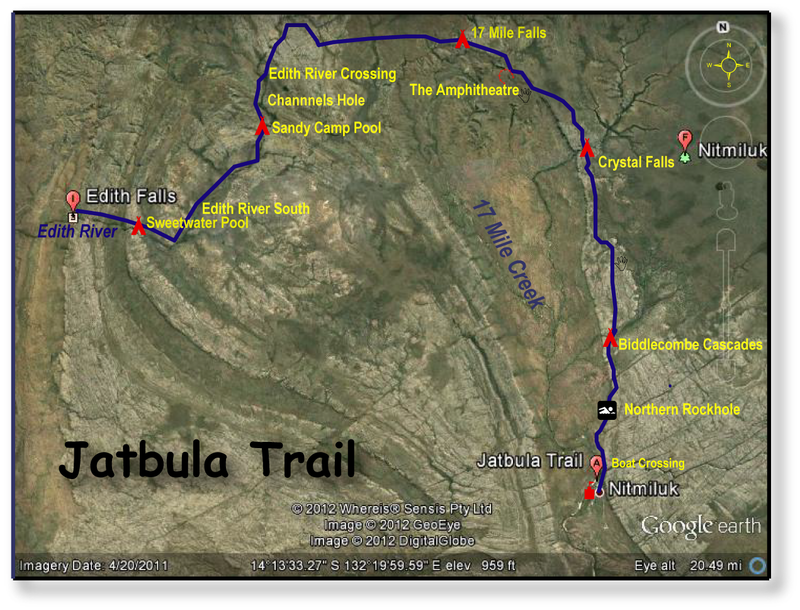 Friday 29 June: Crystal Falls to 17 Mile Falls via The Amphitheatre: 9.5 kms. We were now well into our daily walking rhythm. Packed and ready to rock and roll by 7.00 am. Wading across the cascades first, then the 80 metre climb up onto the plateau. Today we would finish our northward march before swinging west towards the Edith River catchment tomorrow. Tonight’s campsite at Seventeen Mile Falls is a titch over the half way point on the Jatbula. This was going to be very easy walking across a stony plateau cut by the occasional dry gully and boggy swamps, still spongy from the wet season. 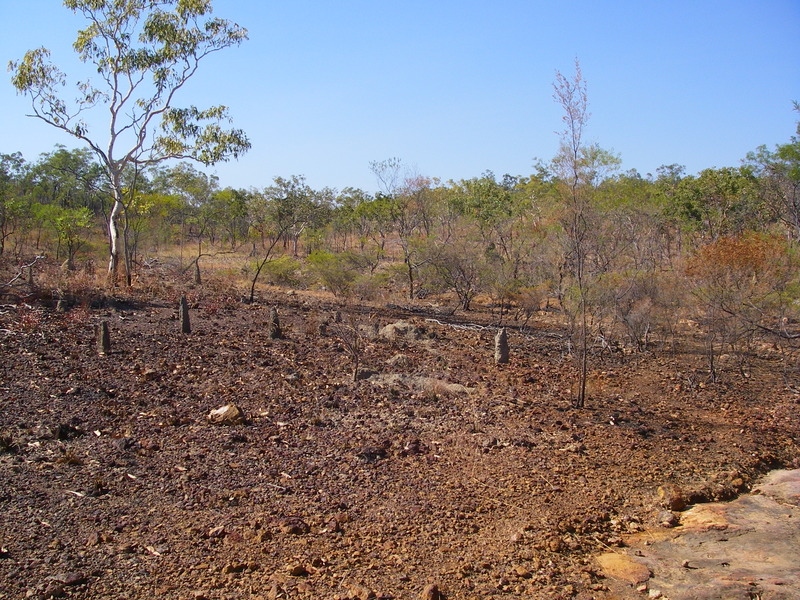 Laterised surface near 17 Mile Falls, Jatbula Trail, NT. We were motoring along at a respectable pace when Brian ground to a halt. A blowout in the driver’s side boot. No RACQ service here. So he jury-rigged a temporary fix, thick rubber bands and electrical tape. Interestingly, Ross and a walker from another group also had boot problems. Possibly boot glues drying out in the low humidity. Something to be checked on before extended walking in the Territory. By mid morning we were traversing burnt out open woodland, a moonscape of rocky pavement covered by ironstone. Since Biddlecombe, on the very highest ridges at about 300 metres we found nodules and cappings of ironstone or ferricrete. 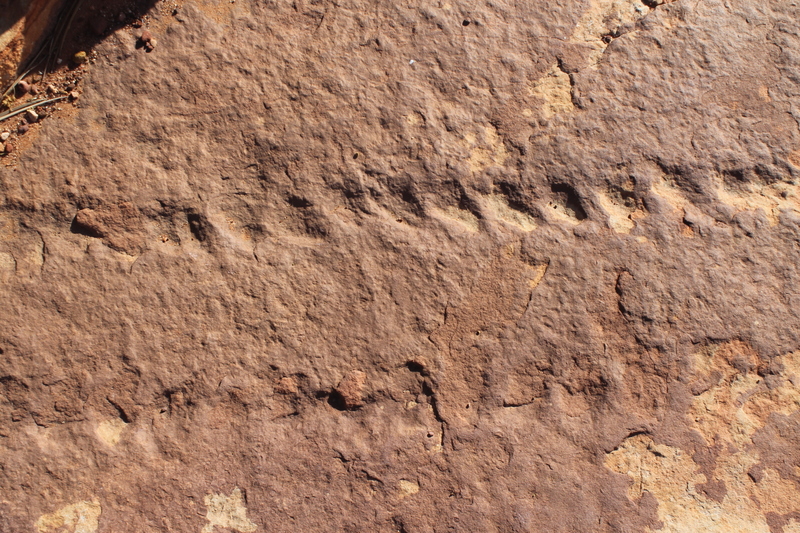 These nodules were formed by the laterisation of the Cretaceous sandstones which overlie the Kombolgie Formation. During the Tertiary starting 70 million years ago, much of northern Australia was subjected to a humid tropical climatic regime. Under high rainfall conditions hydrated oxides of iron and aluminium accumulate steadily in surface rocks as other minerals are leached out, so that a hard iron rich crust develops. The track led out to the escarpment’s edge where we pulled up at a horse-shoe ring of cliffs, The Amphitheatre. Below in its basin was a cool clear stream trickling under the dappled shade of a pocket of sandstone monsoonal rainforest. The Amphitheatre,Jatbula Trail, NT. A major site for aboriginal art. The rainforest canopy is dominated by Native Apple Tree (Syzygium spp. ), Leichhardt Tree (Nauclea orientalis), Carpentaria Palm (Carpentaria acuminata), Native Nutmeg (Myristica insipida) and the White Paperbark (Melaleuca leucadendra). Nestled in their shade were numerous ferns and flowering shrubs like Melastoma polyanthum. 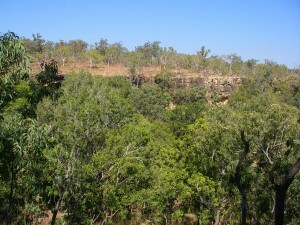 These pockets are considered to be relict plant communities from a time when much of the Top End was covered by rainforest. There are said to be 420 rock art sites in Nitmiluk, but one of the best is along the walls of The Amphitheatre. Three main panels display a mixture of Pre-Estuarine and Estuarine Art styles. Early designs of hand stencils, emus, emu tracks, long-necked turtles mixed with later art styles from the Estuarine Period (8000 to 2000 BP). 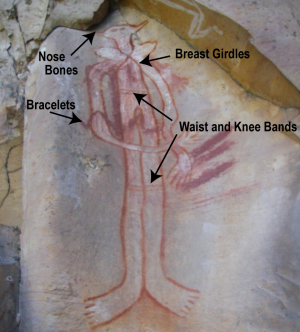 These included Yam Figure Style, X-ray art, and most spectacularly, a large humanoid figure of a Jawoyn Lady wearing nose bones, breast girdles, bracelets, waist and knee bands. From the coolth of The Amphitheatre it was onward across the baking savannah, at least 32°C and hardly a breath of wind for the three kilometres to our campsite. Interestingly, despite the high temperatures I heard no cicadas for most of the trip. Perhaps the humidity was too low (generally below 20%) for hatching. The track quickly wound out to another lookout, this time for a view of Seventeen Mile Falls, the highest single-drop fall in Nitmiluk. Half an hour later we trailed into Hades, our godforsaken burnt-out campsite above the falls. Still, with an excellent rockpool just below the campsite, one was actually in heaven. Lunch in the shade, sprawled out on a rock shelf, washing of clothes, swims, and more swims. A whole afternoon of general lethargy stretched ahead. Lying on the rocks, books in hand. Ross and Linda engrossed in Michener’s Hawaii; Di, Lyn and I delving into Jodi Picout’s 19 minutes; Sally lounging in the water; Brian still fussing away over his bodgy boots and Don, an afternoon of rockwalling his tent site in an effort to keep out the passing campground riff-raff. Late in the afternoon Marion and Charlie again slipped silently away from the campsite, off on another of their evening rambles. I waited and watched. Sure enough, they re-appeared on a rocky outcrop high above the campsite, overlooking the falls. I knew I could count on them to ferret out the ideal eyrie for a look at the falls and down Seventeen Mile Creek. We formed up and wandered up to join them. Another warmish evening. No campfires allowed, but we sat around chewing the fat while the moon rose. Too bad about the moonshine, for it is said that the glow of the lights of Katherine are visible to the south west. 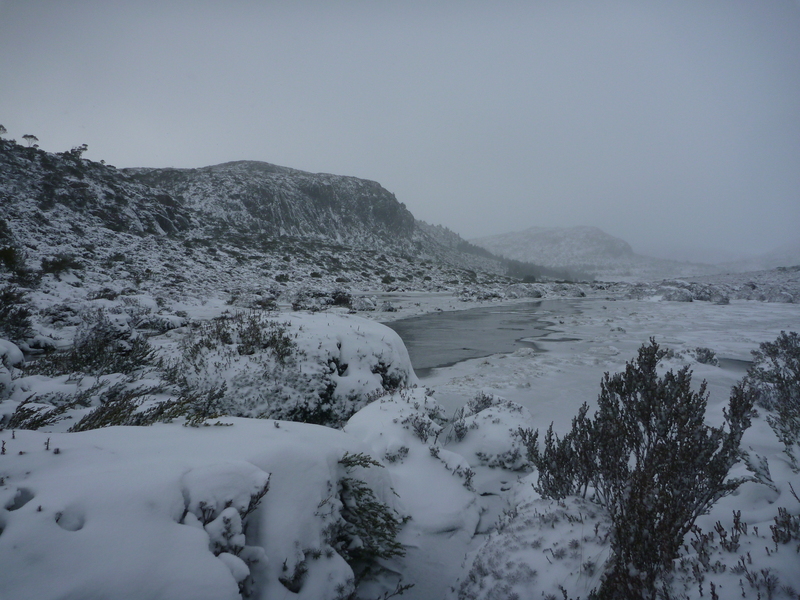 Saturday 30 June: 17 Mile Falls to Sandy Pool Camp: 16.5 kms. Our longest day, sixteen kilometres. Sunrise came soon after 7.00 am, a blood-red sun shrouded in a curtain of smoke haze. The iconic Top End sunrise. Fire is an integral part of Nitmiluk’s landscapes and its aboriginal custodians and Parks staff burn off during Malaparr, the early dry season from May to June. It is then that the grasses still contain a little moisture and the burn-off will be low intensity and will generally falter at watercourses, swamps and rock pavement. For much of our walk we encountered patchworks of burnt and unburnt areas, presumably to suppress the possibility of a major wildfire along the track and at campsites. Our last hours on the stony plateau country, again travelling on the high laterised surfaces. We were now on the drainage divide between the Edith River and Seventeen Mile Creek. As always termite mounds abounded, one of the most ubiquitous features of the Northern Territory landscapes. Right up there with the favourite Top End images of crocs, waterfalls and red sunsets. Here the surrounding termite mounds took on a distinctly reddish tinge in contrast to the lighter coloured mounds we encountered elsewhere. Wherever there is grass in the Top End, there are termites, which is everywhere. During the long dry season it is so dry that other important recyclers like earthworms cannot survive. So termites are known as the ‘earthworms of the tropics’. The termite is an ancient order of insect which has been ranging the earth for as long as crocs, some 30 million years. Its nearest relative is the cockroach, not ants. Hence the name ‘white ant’ is a misnomer. Most termites have simple appetites, content to graze on dead grass, seeds and wood, converting cellulose directly into glucose for energy. But the most primitive group, the Masto termite, endemic to Australia, is not so particular and has been found happily munching through old car battery cases, bitumen highways, PVC, lead sheathing on Telstra cables and demolishing a three bedroom house in a single 10 week feeding frenzy; much like our pre-trip poolside breakfasters. 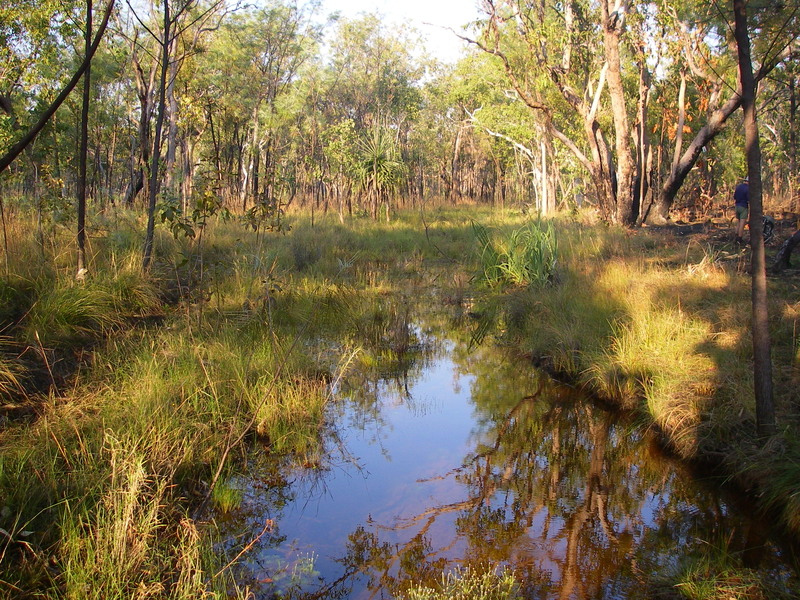 Our route took us westwards off the stone country into an unnamed swampy headwater tributary of the Edith River. 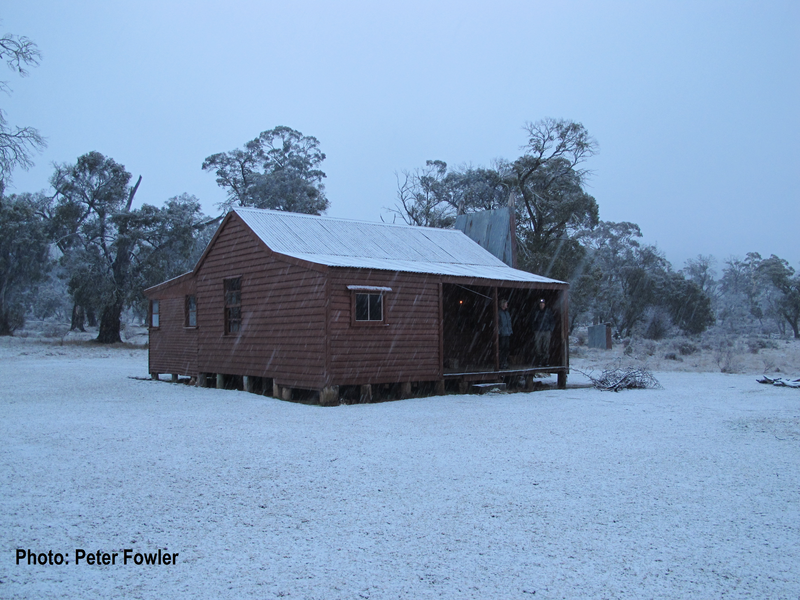 The Edith River was named by William McMinn in 1871 during the construction of the Overland Telegraph Line. Lady Edith Fergusson was the wife of the South Australian Governor, Sir James Fergusson. 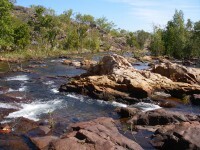 Edith River Soaks, Jatbula Trail, NT. Here was a different landscape, a mosaic of swampy grasslands, riverine forest and open woodlands. The vegetation around us marked the change, now pandanus, melaleucas, banksias and grevilleas. 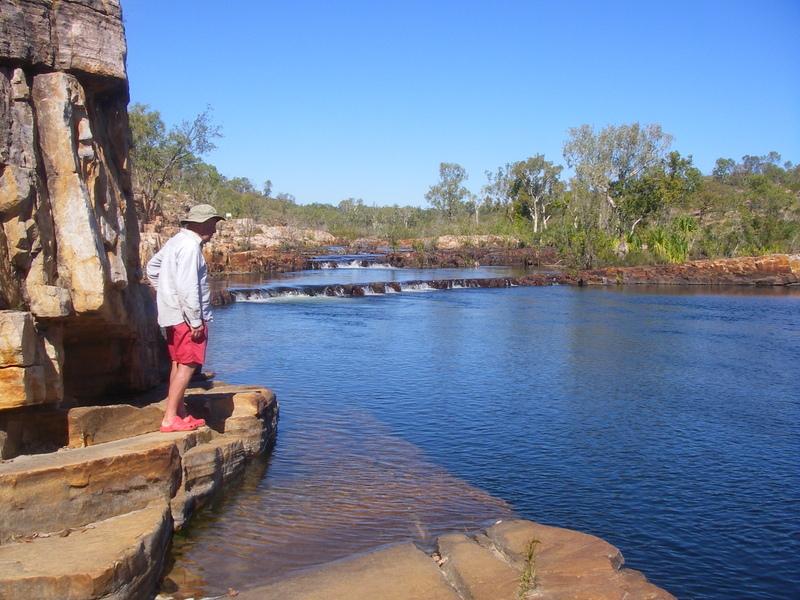 We had reached the Edith River Soaks, a landmark for drovers which signalled that they had finally left behind the harsh stone country for the succulent grasses of the Edith River floodplain. Some three hours of early morning hard yakka paid off as we cruised into the Edith River Crossing and a well-earned dip. Here the Jatbula shifts to the western bank all the way downstream to Leliyn. A quick feed and we took off on the six kilometre hop to Sandy Camp Pool hoping to beat the heat as my pack thermometer was fast cranking up, a mid-morning 32°C. Sandy Camp is one of the highlights of the walk, easily the most picturesque of Jatbula’s pools. The campsite nestled on a sandy beach under shady trees. A few metres from my tent I launched into the deep clear waters of Sandy Camp Pool. Fantastic. Sunday 1 July: Sandy Camp Pool to Sweetwater: 10 kms. mid-day we rounded up onto a low river bluff overlooking the Sweetwater. Below, those toads of the trail… day trippers. Four of the cheeky blighters frolicking in the cascades above Sweetwater Pool. Our throughwalking solitude was over. Sweetwater is easily accessible to day walkers so we could expect to see legions on the move in our final 24 hours on the track. A final lux afternoon of swims, rambles around the Sweetwater, botanising, checking out the sandstone ripple marks, more reading and brew-ups. Having exhausted these possibilities for the productive use of my time, I turned my attention to niggling Don about his ongoing refusal to buy a Thermarest banana lounge. After many years of badgering he finally caved in and agreed to try one out and grudgingly conceded it was “…comfortable”. But stubbornly unconvinced. Thence to Brian, whose beloved ancient hike tent stood agape where several zips now refused to close, its flaps cobbled together with a network of safety pins. 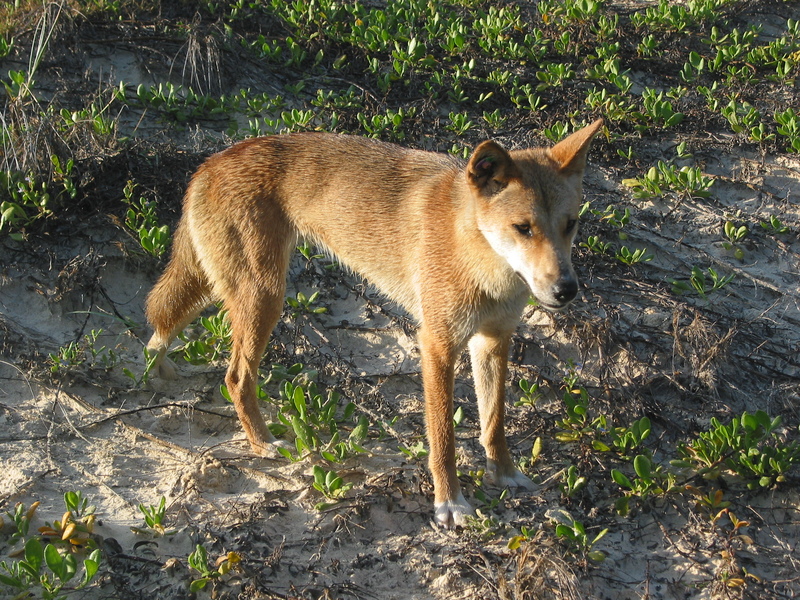 “It’ll see me out.” With dingoes serenading in the near distance we drifted off to our beds, but not before peering into the dark then pulling our boots into our tents and finally zipping the doors firmly closed. We left Brian to his fate. Monday 2 July: Sweetwater to Leliyn: 4 kms. A cool 11°C start for our final two hours on the track, Leliyn being a mere four kilometres away, passing numerous rapids and the Longhole on our way through. We were now a pretty subdued bunch. After such an outstanding trip I wouldn’t have minded a few more days on the track. All good things come to an end and we pulled into the well-appointed Leliyn campground soon after 10.00 am. But we quickly perked up when the campground manager threw open the chuck wagon and we tucked into a truck load of pies, sausage rolls, potato chips, chocolates and soft drinks. An afternoon of general slacking around and desultory walks completed a memorable six days of walking with great companions and excellent leadership provided by Ross and co- organizer Linda.